While Republican lawmakers remain far apart on key portions of the budget, Governor Scott Walker is remaining optimistic they will finish close to on time. The governor was in Fitchburg Monday, as a part of an ongoing state tour he’s been doing to urge lawmakers to pass a transportation funding plan that doesn’t raise taxes or fees. Walker has also visited schools across the state, to help boost support for his K-12 education budget. While work on the budget continues, Republican leaders from the Senate and Assembly appear to be facing a stalemate over how to proceed on those issues. The Joint Finance Committee has not yet scheduled any further meetings, with less than a month to go before the state’s fiscal year ends. 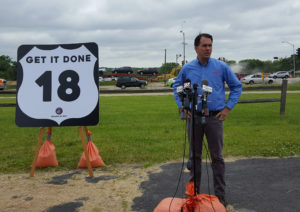 However, Walker noted on Monday that the last state budget was signed after the fiscal year ended on June 30, and he believes this one will be done “pretty close” to that date. “A week or two really isn’t much of a delay,” he argued. If a budget has not been passed by the end of the month, the current state funding levels continue.